- I trust the director will be satisfied when reading my melodrama... I really regret having written it in only six acts! During the 1840s, the melodrama was the most popular form of theater. Episodic in structure, these plays often had villains posing threats and heroes ensuring happy endings. 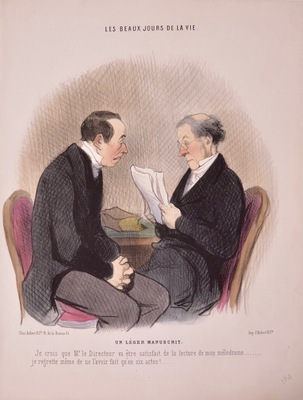 Although Daumier’s author regrets only writing six acts, melodramas were usually only two to four acts in length—although some “serious” plays had five acts.